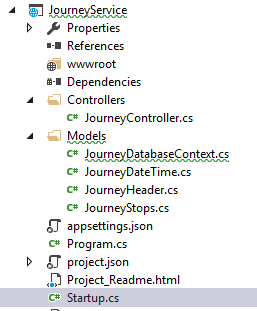 To just quickly explain what this is doing: we have a DbContext called ApplicationDbContext and we’re building a set of options on top of that context. We’re then instantiating the context and cleaning the in memory database. Finally, we’re adding a new piece of data to the context and then asserting that it has been added. Told you it was nifty. 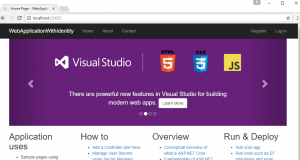 But what about if you’re still using Entity Framework 6? 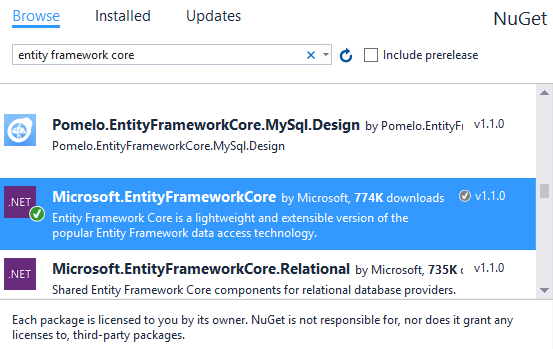 Out of the box, EF does not come with this kind of functionality; however, I recently came across (and contributed) to a NuGet library that provides just such a facility. It provides a wrapper for both Moq and Nsubstitute. The GitHub Repo is here. This entry was posted in Entity Framework, Entity Framework Core, Unit Testing and tagged Entity Framework, Entity Framework Core, Moq, NSubstitute, Unit Test, UseInMemoryDatabase on September 16, 2018 by pcmichaels. 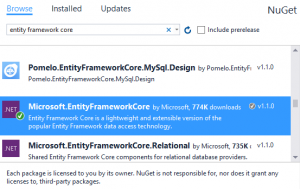 Entity Framework can be difficult to get started with: especially if you come from a background of accessing the database directly, it can seem like there are endless meaningless errors that appear. 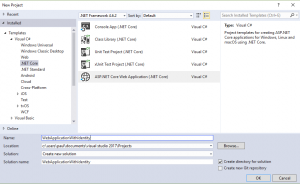 In this post, I try to set-up EF Core using a .Net Core Console application. In order to better understand the errors, we’ll just do the minimum in each step; and be guided by the errors. 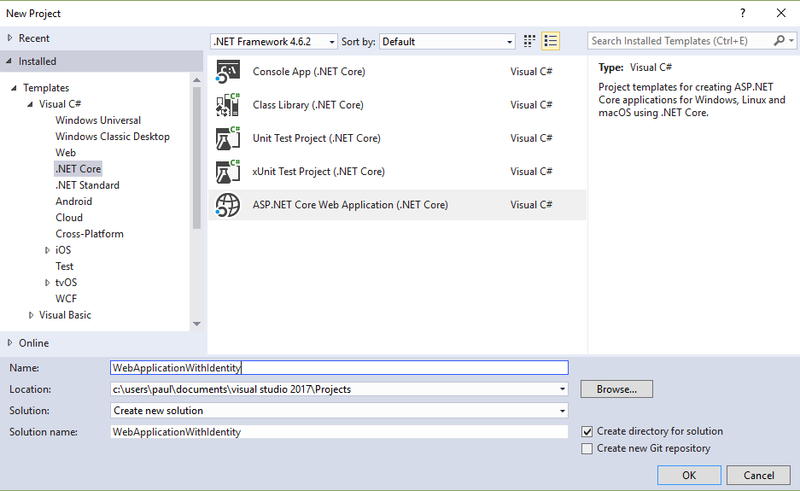 The first step is to create a .Net Core Console Application. In the package manager console. No DbContext was found in assembly ‘ConsoleApp1’. Ensure that you’re using the correct assembly and that the type is neither abstract nor generic. System.InvalidOperationException: No database provider has been configured for this DbContext. 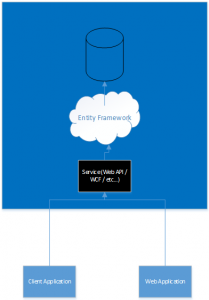 A provider can be configured by overriding the DbContext.OnConfiguring method or by using AddDbContext on the application service provider. No migrations were applied. The database is already up to date. System.InvalidOperationException: The entity type ‘MyData’ requires a primary key to be defined. And it has, indeed, created a table! 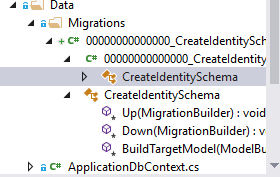 This entry was posted in .Net Core, C#, Console Applications, Entity Framework, Entity Framework Core, SQL Server and tagged Add-Migration, Entity Framework, Entity Framework Core, Migration, No DbContext was found in assembly, No migrations were applied. 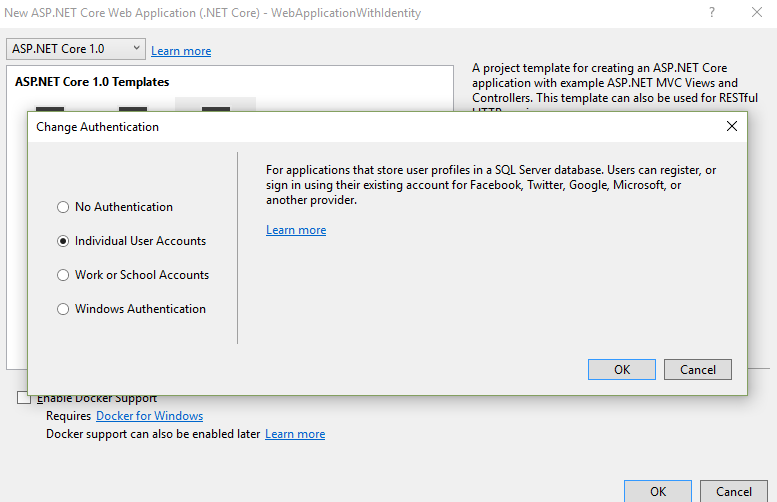 The database is already up to date., Primary Key, SQL Server, System.InvalidOperationException: No database provider has been configured for this DbContext, System.InvalidOperationException: The entity type 'MyData' requires a primary key to be defined., Update-Database, [Key] on February 24, 2018 by pcmichaels. 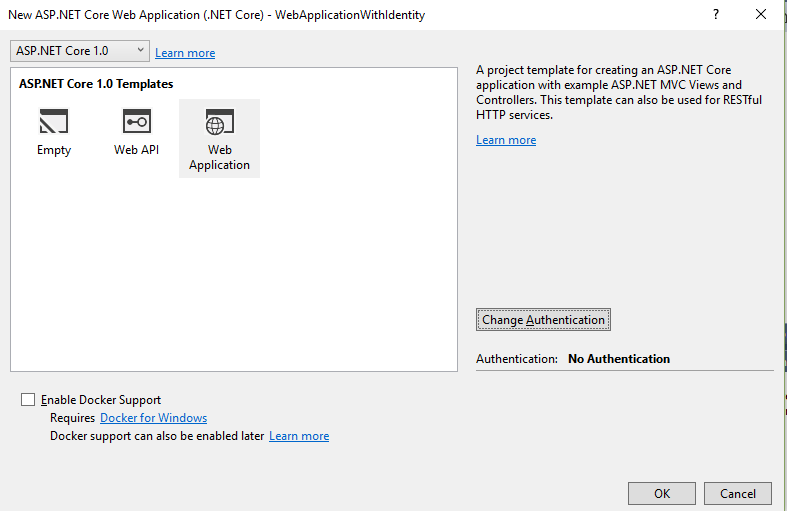 If you create a new ASP.Net application, you get a built-in log-in feature – it provides the log-in page, all the back end services and even the DB tables. It does assume that your DB and your web-site are physically located on the same server (or at least that the web site can directly access the DB). 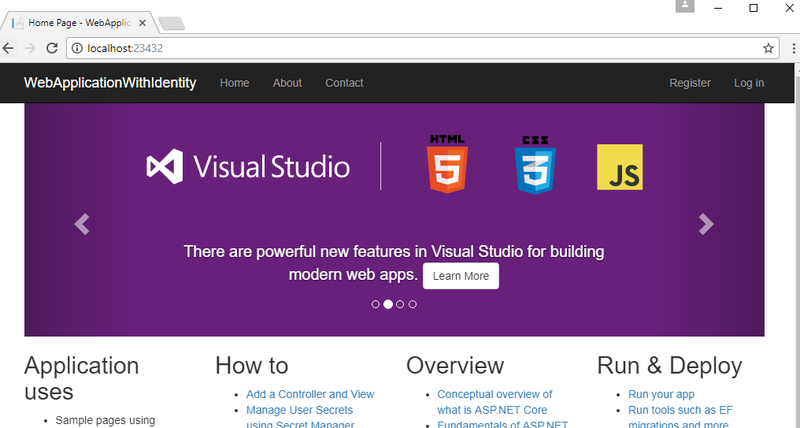 Asp.Net Core also provides this, but it’s slightly different. 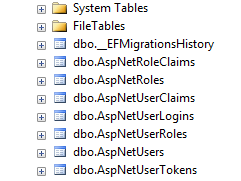 It does still use Entity Framework (Core), and it does still assume direct access to the DB. 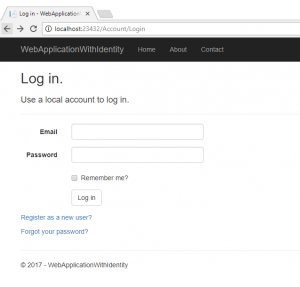 If you’re creating a standard self-authenticating web page, then Individual is the answer. 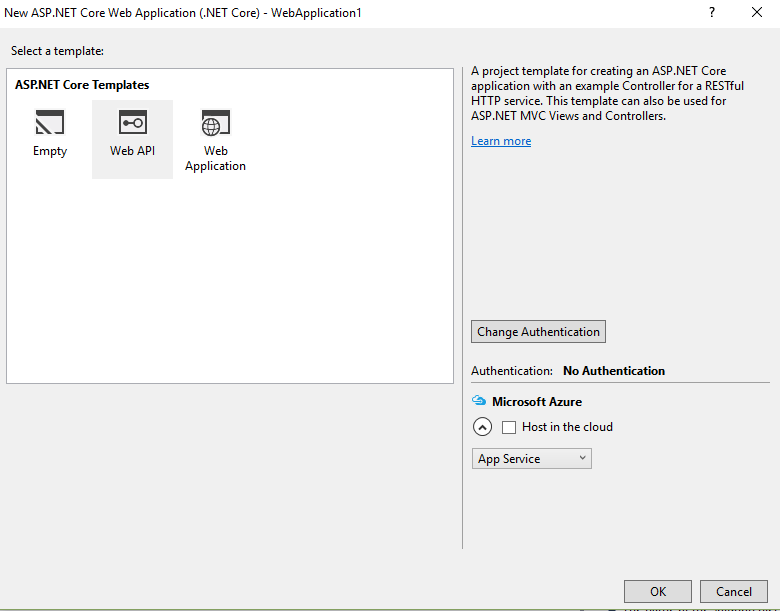 “Windows Authentication” allows you to defer authentication to your domain, and “Work or School Account” allows you to use Microsoft’s own security using AD, Azure or Office 365. 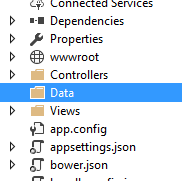 So far so good; but what if you have already created a web app using ASP.Net Core and want to retrospectively fit this functionality? Obviously, adding this functionality can depend on what you’re adding it to. 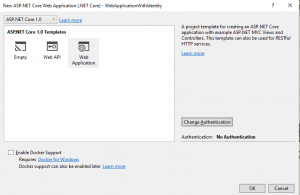 The following was compiled from an ASP.Net Core app created without identity services, and then retrofitted with them. In order to do this, I strongly recommend starting with a dummy app created as above, as there’s a lot of cutting and pasting coming up. 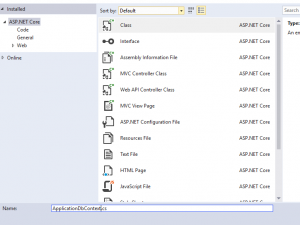 // Customize the ASP.NET Identity model and override the defaults if needed. 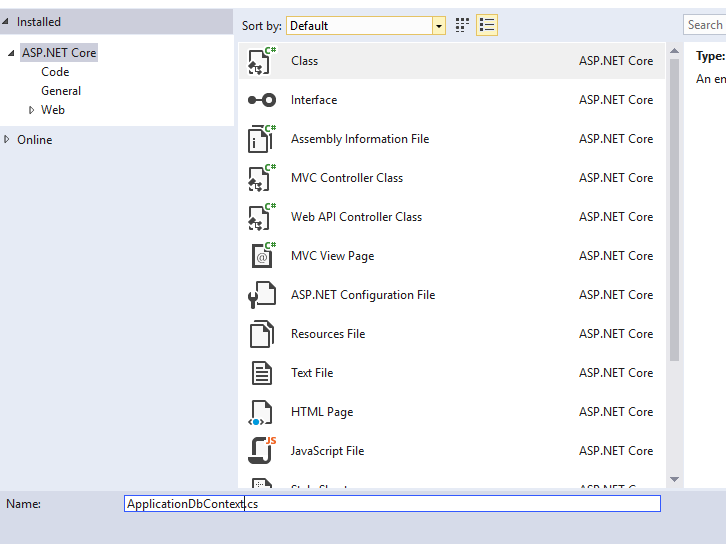 // For example, you can rename the ASP.NET Identity table names and more. To deal with two factor authentication, you’ll need an implementation of a message sender. I initially became confused with this naming, and it refers to a class that sends messages (e-mails, etc), and not message in any of the many other senses you may imagine. // Plug in your email service here to send an email. // Plug in your SMS service here to send a text message. The controllers are the drivers for functionality in MVC; the following details how the log-in system will function. // Request a redirect to the external login provider. 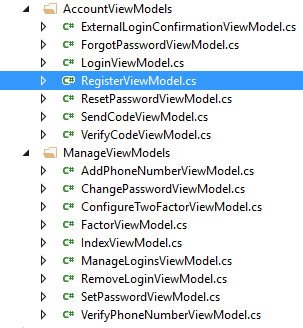 // Sign in the user with this external login provider if the user already has a login. // If the user does not have an account, then ask the user to create an account. // The following code protects for brute force attacks against the two factor codes. // will be locked out for a specified amount of time. … and that’s it. 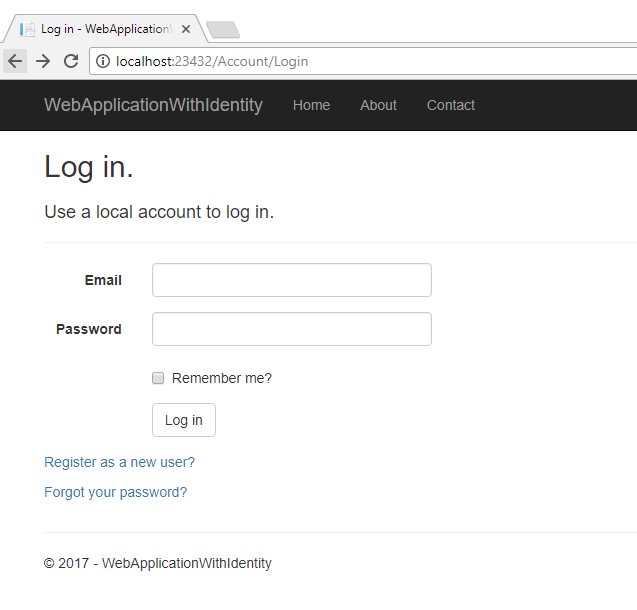 When you’re done, your website should provide basic log-in and register functionality; the following section has some suggestions about what to do if it does not. The following are errors you may encounter at this stage, depending on what state your project was in before you started this. An unhandled exception occurred while processing the request. 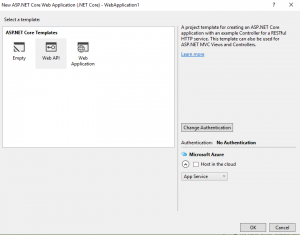 InvalidOperationException: Unable to resolve service for type ‘MyWebApp.Data.ApplicationDbContext’ while attempting to activate ‘Microsoft.AspNetCore.Identity.EntityFrameworkCore.UserStore`4[MyWebApp.Models.ApplicationUser,Microsoft.AspNetCore.Identity.EntityFrameworkCore.IdentityRole,MyWebApp.Data.ApplicationDbContext,System.String]’. ArgumentNullException: Value cannot be null. An error occurred during the compilation of a resource required to process this request. Please review the following specific error details and modify your source code appropriately. Just to point out the obvious here: I didn’t create this identity system, I simply took what was supplied by default, and applied it to an existing project. The code above is not mine – it’s all copied and pasted by simply creating a new project with Identity Services and copying the relevant parts. 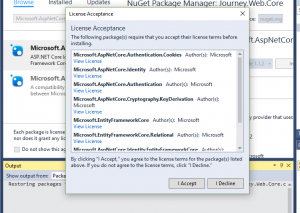 This entry was posted in Asp.NET Core, Entity Framework Core and tagged An error occurred during the compilation of a resource required to process this request, ArgumentNullException: Value cannot be null. 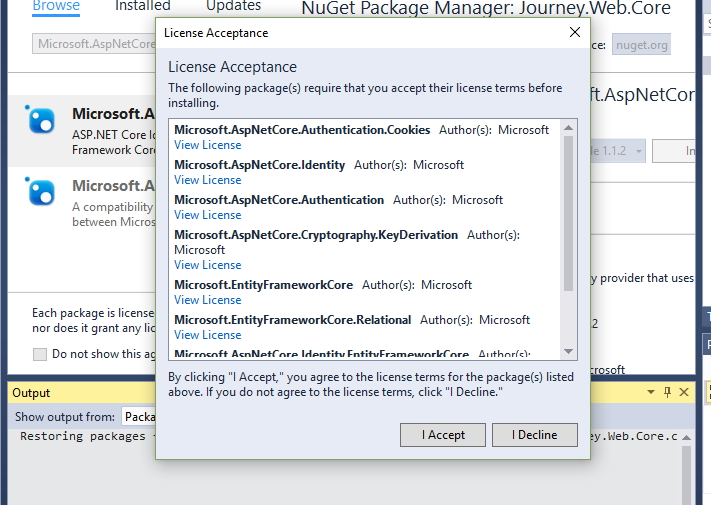 Parameter name: connectionString, ASP.Net Core, AspNetUsers, dotnet ef database update, Entity Framework Core, Identity, IdentityRole, InvalidOperationException: Unable to resolve service for type ‘ApplicationDbContext’ while attempting to activate, Microsoft.AspNetCore.Identity.EntityFrameworkCore, Update-Database on July 30, 2017 by pcmichaels. Say what you like about ORM frameworks, but they do decrease time to market. My impression, as someone that has generally had very little exposure to them, is that, whilst they can make it very quick to get something up and running, they make it very easy to shoot yourself in the foot. 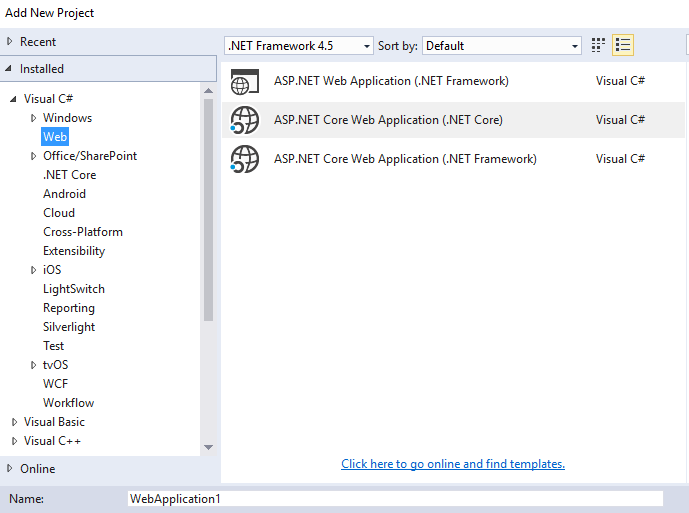 With all the hype about .Net Core, I thought I’d give EF Core a go, and this post is a document of my initial set-up which was, by no means, a straight forward process! 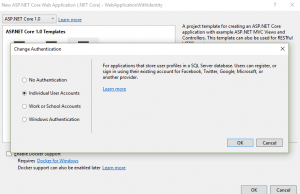 The great advantage of this is that you can very quickly make database changes and maintain a layer of abstraction between the DB and the accessing layer. Obviously, the downside is that you don’t have the same level of control over this access. I used x64. That matters when you get further down. In this particular installation, I’m using the “Database First” model. 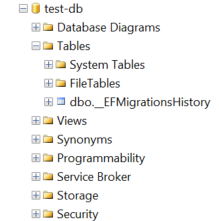 What that means is that I already have a database, and it is sat on an accessible machine. The following project will create classes to access that. 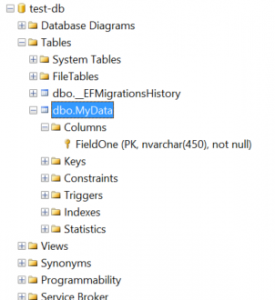 For details of how to create a database using a VS project, see this article that I wrote on unit testing databases. The first step is to create your project. 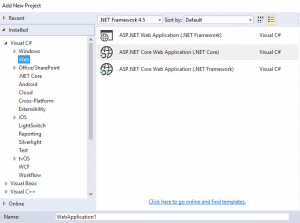 What is the difference between ASP.NET Core (.NET Core) and ASP.NET Core (.NET Framework)? In this instance, we’ll go with .Net Core. 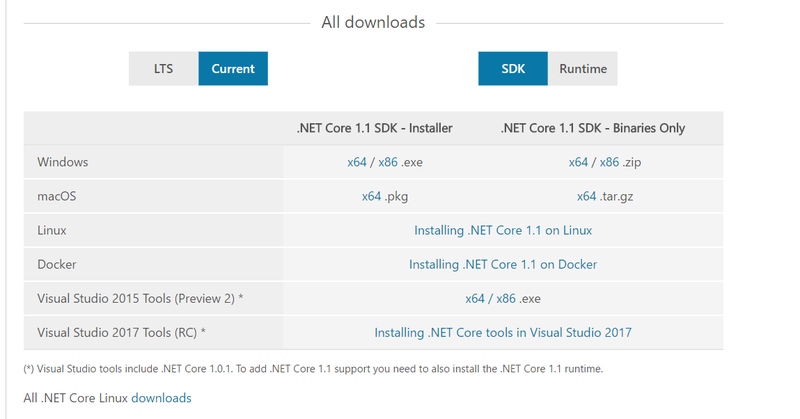 The difference between the two is that one of them (.NET Framework) references the .NET Framework, and so will not be cross platform. 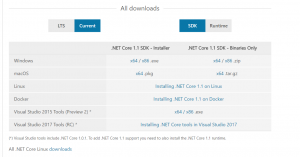 Obviously, picking .NET Core is your smallest footprint, and least functionality. 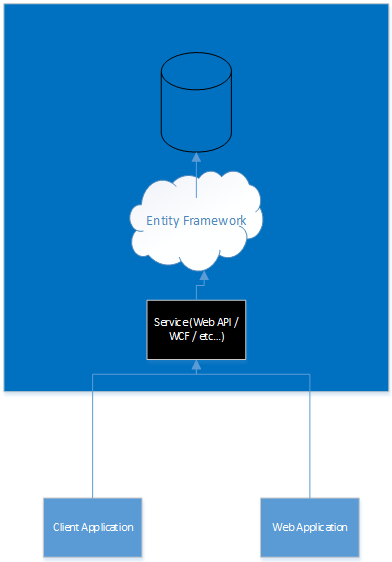 Pick Web API here, as we’re essentially just writing a service that accesses a DB (see the diagram above). VS should do the rest. "JourneyDB": "Data Source=ServerName\\DatabaseInstance; Initial Catalog=MyDatabase; Integrated Security=SSPI"
So, you should now have a project that’s ready to go. I suggestion, unless you’re reading this in around a year from now (2018) when all this has been stabilised, is that you restart VS. In fact, this should be your first response if anything in this post doesn’t do what you expect (it is still in preview, so I’m not judging). What should that do (because it doesn’t)? This entry was posted in Asp.NET Core, C#, Entity Framework, Web API and tagged Database First, dotnet, dotnet restore, EF, Entity Framework, Entity Framework Core, Microsoft.ApplicationInsights.AspNetCore, Microsoft.EntityFrameworkCore, project.json, Scaffold-DbContext, Scaffolding, Web API on March 4, 2017 by pcmichaels.